Innovation is our business, leading what is next. (1) If you are an IAB member – register as “IAB Member (industry).” There is a $100 registration fee per person. This fee will be used to subsidize all students to attend the dinner on Day 1. Thank you for your generous support! 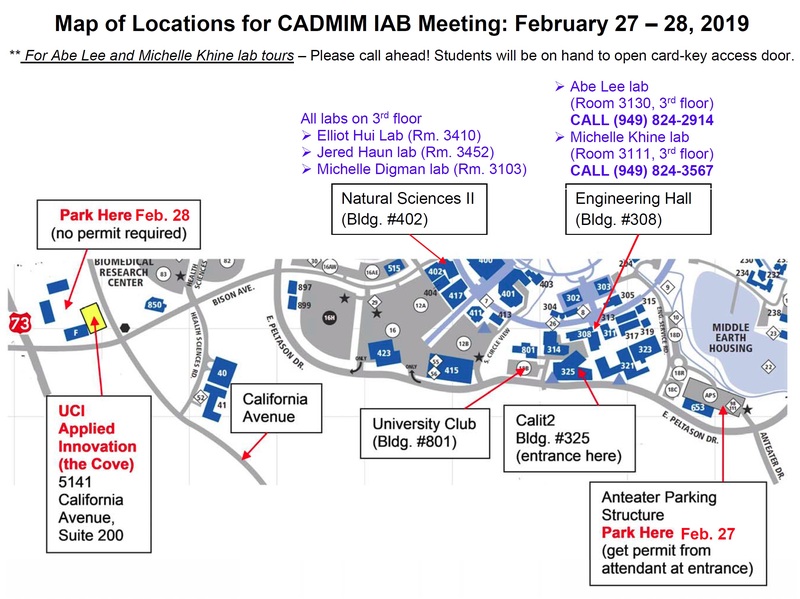 (2) If you are NOT an IAB member – please register as a “Faculty, Student, Post-doc, NSF, or staff.” No fees for academic and NSF participants. The recommended hotel for this meeting is the Wyndham Irvine. Other hotels can be used, but private vans (UCI Fleet Services) have been arranged for guests staying at the Wyndham Hotel only. To secure this rate, on-line hotel reservations must be made before February 4, 2019. If you will be flying into Los Angeles International Airport (LAX) or Long Beach Airport (LGB) rather than Orange County airport (SNA), schedule your ride online at SuperShuttle website: www.supershuttle.com. SuperShuttle offers door to door shared-ride transportation to and from local airports. Other alternatives include taxi, Uber, and Lyft. 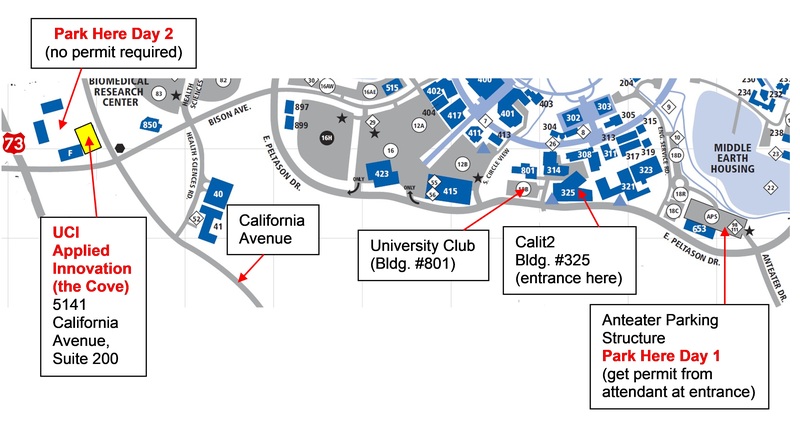 Private vans (UCI Fleet Services) have been arranged to transport guests between UCI, John Wayne Airport, University Club, Applied Innovation, and the Wyndham Hotel in Irvine. Transportation schedule for the days of the meeting is below. 9:00 pm Pick up at University Club Parking Lot to take guests back to Wyndham Hotel. 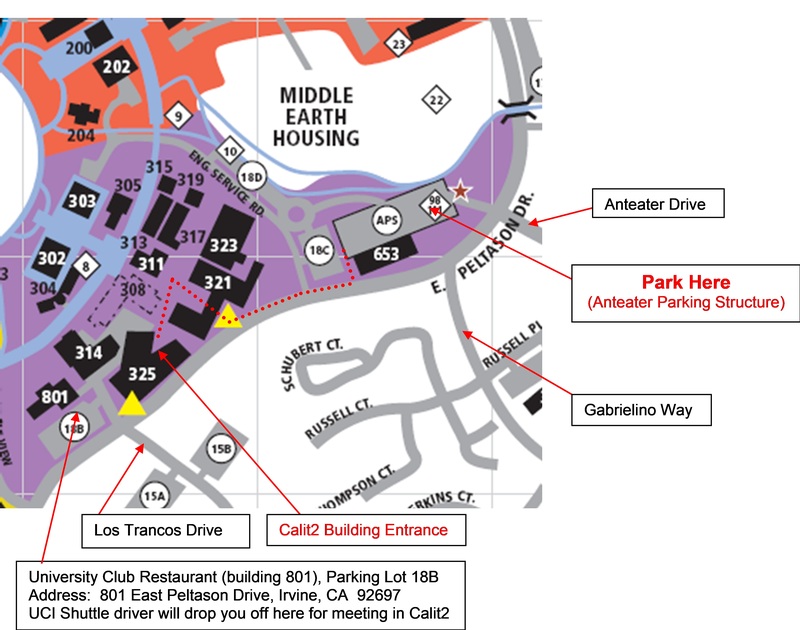 Parking will be provided in the Anteater Parking Structure on Day 1. 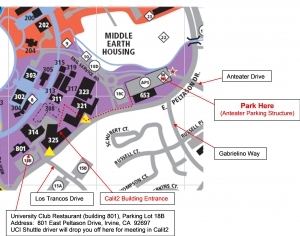 Parking is free at the UCI Applied Innovation (the Cove) on Day 2. Get a permit from the kiosk at the entrance to the structure. 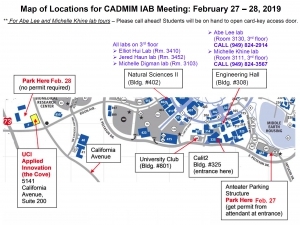 Tell the attendant you are here for the “CADMIM IAB Meeting.” If there is no parking attendant, use the automated machine near the kiosk to obtain a single day parking permit. Entrance to the building faces away from the street (see below). Once you enter the building you will be in the Atrium. Exit highway 73 on Bison Avenue. Turn left on California Avenue. Make the first left into University Research Park. Parking is free. Enter 5141 California Avenue from the parking lot. UCI Applied Innovation is in Suite 200 (second floor). Please bring a portable computer or tablet to this meeting to provide real-time, on-line project feedback via the NSF LIFE forms. Smartphones will also work (iPhone, Android, etc.) but it may be more difficult to enter data. Wireless internet will be available during the entire meeting. Copyright 2017, Center for Advanced Design and Manufacturing of Integrated Microfluidics.